PH:Standard frequency & fixed eccentric moment Vibrodrivers. PHF:High frequency & fixed eccentric moment Vibrodrivers. PHFV:High frequency & variable eccentric moment Vibrodrivers. 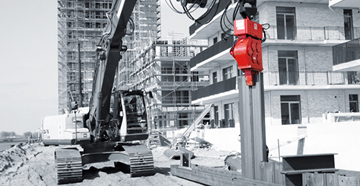 The increasing use of hydraulic excavators in piling jobs, has motivated PTC to develop a complete range of Vibrodrivers that are specifically designed to be mounted directly on the stick of a wide range of excavators. PTC excavator mounted Vibrodrivers allow to easily drive or extract a variety of profiles, such as: sheet piles, H beams, casings, concrete piles and wooden piles.